A century ago, the hospital complex at the historic Ellis Island immigration inspection station was where approximately one out of every 10 arrivals who were too sick to be allowed into the country were sent to recover, or to die. The 29-building medical complex – in its day the largest public health institution in the U.S. – was itself left to die when the immigration station closed in 1954. 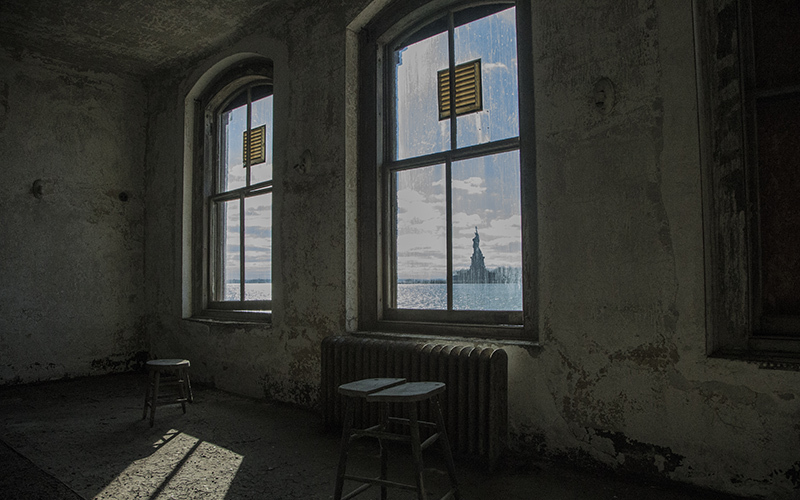 Ellis Island’s Main Building was restored and reopened as an immigration museum in 1990. But the hospital complex on the island’s south side remained shuttered for 60 years until two months ago, when officials opened the dilapidated buildings for public viewing. High-tech policing and a renewed focus on community-officer partnerships are helping to bring calm to Camden, N.J., but it hasn’t been a cure-all. The impoverished town of 77,000 is still the most violent and crime-plagued city in the Garden State. A local police took Yahoo News photographer Gordon Donovan to Camden’s most blighted areas — where illegal drugs are dealt and criminals use the wasteland to try and evade capture. The Renwick Ruin on Manhattan’s Roosevelt Island, also known as the Smallpox Hospital, is located on the southern tip of the island, which was called Blackwell’s Island when the structure was built between 1854 and 1856. A Merrell Class vessel Verrazzano that connected the borough of Staten Island to Manhattan sits in a scrap metal yard on the western shore of Staten Island. Retired several years ago, this boat has been stripped down to its metal frame. Cold and eerie, the boat’s decks are badly deteriorated from neglect and by the elements.